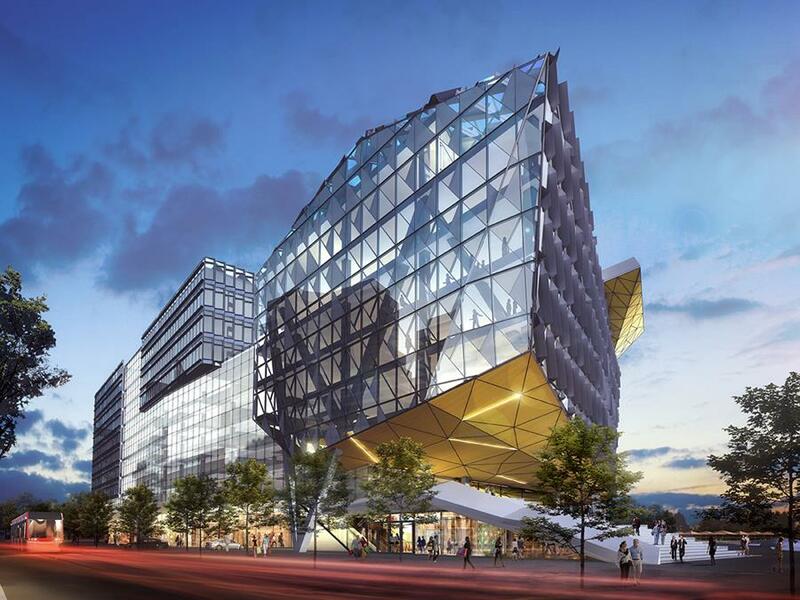 We, at Sweeny&Co, are happy to embark on a new project: Waterfront Innovation Centre. In collaboration with Waterfront Toronto and Menkes Developments, we are designing and developing a cutting-edge workplace, connected to a hub for innovation and exchange of ideas. Entirely funded by the private sector, this project represents the next evolution in commercial office development. It will reinvent how employees work together in Toronto’s rapidly evolving creative and technology sectors. Located next to Canada’s Sugar Beach in the new East Bayfront community, this important private-sector development will generate high-value employment on former industrial lands and support the emergence of East Bayfront as a prime waterfront live-work-play community within minutes of Union Station. At the heart of the Waterfront Innovation Centre is the waterfront-wide ultra-high-speed broadband fibre-optic network—a private sector initiative that is delivering internet connection speeds exponentially faster than the North American average. Future tenants of the Waterfront Innovation Centre will benefit from this network to support their work in data-intensive industries. The Waterfront Innovation Centre is a celebration of the positive attributes of the urban environment. An extension of the public realm, horizontally and vertically, it extends Sugar Beach to the public roof garden through the atrium—or rather, the Nexus. This will in effect create a large public space for use by the building inhabitants and the greater community, offering urban activities such as cafes, restaurants, retail, and entertainment spaces. The Waterfront Innovation Centre will do something few, if any, buildings do for the companies that inhabit them: provide shared state-of-the-art, multi-purpose facilities for meetings, presentations, interactive learning, performances, town hall gatherings—a place for the critical exchange of ideas. 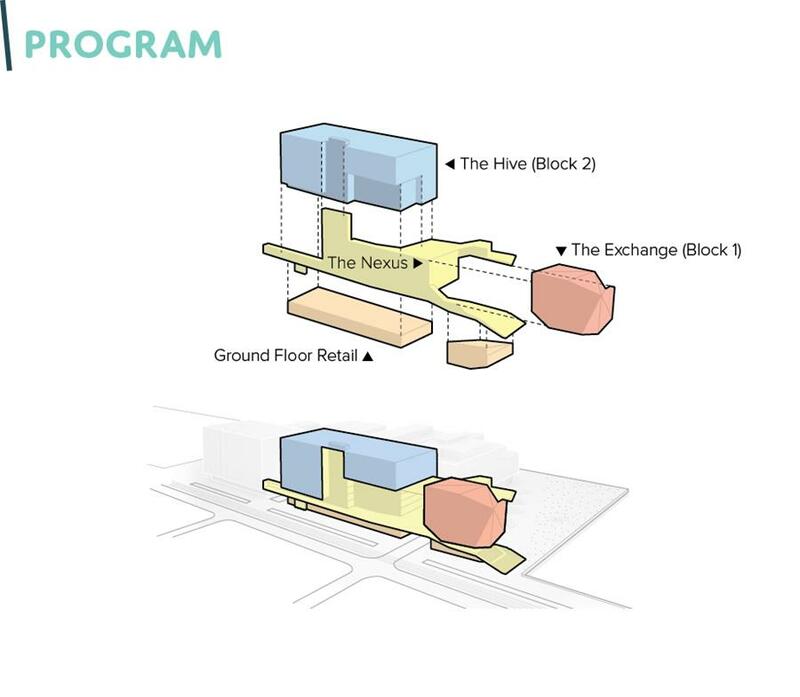 Called the Exchange, the facility will have direct access to the extended public realm, the Nexus, providing a fluid transition from the workplace, to formal and informal social space, all designed to facilitate and encourage discourse and Innovation. The Hive is the new workplace that supports independent work, creation, problem-solving and task-oriented organizations. The workplace of tomorrow must be a model of flexibility. It must easily, quickly and economically transform into infinite configurations. Like a theatre, ready for all new props, actors and performances, the Waterfront Innovation Centre offers the Hive: a workplace that is totally flexible, re-configurable and can easily and cost effectively be transformed into whatever is required to enhance performance, reduce the time to market and, above all else, facilitate new ways to work, create, solve and collaborate or, in other words, innovate. The development of the Waterfront Innovation Centre is the next step in the implementation of the East Bayfront Precinct Plan developed by Waterfront Toronto and the City of Toronto as approved by City Council in 2006. Targeting LEED® Platinum, it meets an emerging demand for purpose-built office space in Toronto, fostering our city’s creative industries. Sweeny &Co Architects is pleased to be part of this important initiative that will further strengthen the revitalization of our waterfront! Sweeny&Co highly respects your privacy. we need your consent to continue our communication with you.